The New York City Department of Environmental Protection (DEP) today encouraged property owners to go green by releasing a streamlined green roof funding schedule for its Green Infrastructure Grant Program. DEP is engaged in a citywide effort to soften the impervious urban landscape and is encouraging private property owners to install green infrastructure, which allows stormwater to be naturally absorbed into the ground. By keeping stormwater out of the City’s combined sewer system, green infrastructure helps to reduce overflows into local waterways during rainstorms. Green roofs are an important part of achieving reductions in stormwater runoff, as rooftops account for a sizable portion of impervious area in New York City. “We must protect our Earth. While Earth Day marks a special day of tribute to our world and brings awareness to the importance of its preservation, there are things we can do every day to make it a better and healthier place. Our concrete jungle has so many negative effects on our Earth, especially with respect to storm water. Luckily, Commissioner Sapienza and DEP are making great progress in reducing the harmful effects of storm water runoff, while also creating new urban green spaces. I applaud DEP’s efforts and encourage all my constituents to take advantage of their generous Green Infrastructure Grant Program,” said Assembly Member Joseph R. Lentol (D-North Brooklyn). “I am thrilled that DEP is redoubling its efforts to get NYC property owners to install green roofs. In a city of asphalt and concrete, we need to be creative about how we limit rainwater runoff into our sewers and waterways—and turning our roofs into green spaces is also a terrific way to cool our city. 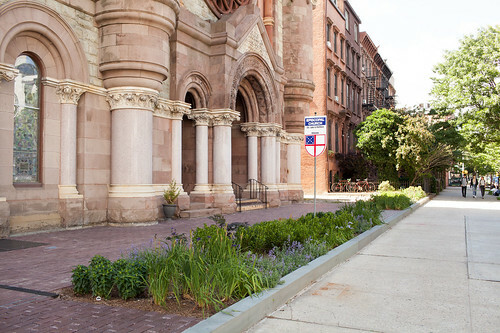 By streamlining the Green Infrastructure Grant Program, DEP is building on its great work to ensure a sustainable future for New York, perfect for celebrating Earth Day,” said Council Member Helen Rosenthal (Manhattan, District 6). Community Board 11 has been an advocate for increased storm water absorption to prevent combined sewer overflow events. Through DEP’s streamlined green roof funding schedule for the Green Infrastructure Grant Program, property owners in the Bath Beach and Bensonhurst communities can play a role in our resiliency, increased permeability and sustainability, said Marnee Elias-Pavia, District Manager of Community Board 11. “Green Roofs make our city a greener and healthier place to live. I urge every homeowner to apply today,” said Theresa Scavo, Chairperson of Brooklyn Community Board 15. To date, DEP has committed over $14.5 million to 35 projects through the Green Infrastructure Grant Program. Not-for-profit organizations, private property owners and businesses are eligible for funding for projects that use green infrastructure to reduce or manage stormwater on private property. DEP accepts applications on a rolling basis, year round. Consideration will be given to projects that are cost effective, provide matching funds or other contributions, and include training and workforce development. Green roofs have been a popular request from the Grant Program since it was initiated in 2011, making up 60 percent of funded projects to date. DEP is hoping to encourage more proposals and increase awareness of the funding available for private property owners. There are no restrictions on types of plantings; sedums, native plants, and vegetables, for example, are all eligible. The new funding schedule sets reimbursement rates for green roof projects based on planted area and depth of the growing medium. The new funding schedule and project guidelines provide applicants with an upfront understanding of DEP’s cost-effectiveness criteria for green roof projects, and eliminates uncertainty over how much funding may be available. By providing this information to applicants in advance, DEP is able to fast track green roof grant applications, with anticipated design approval within 90 days from the submittal date. The highest funding rate of $30 per square foot (SF) is available for projects that include 3,500-20,000 SF of planted area and that have 4 inches of growing media depth, with reduced rates available for projects with shallower depths. For projects larger than 20,000 SF, funding is also available, see table below. For those projects meeting the requirements for $30/SF, this is the highest green roof incentive in the nation. Interested applicants can find more details on DEP’s Green Infrastructure Grant Program webpage: nyc.gov/dep/grantprogram, or email gigrant@dep.nyc.gov with questions. Like many older urban centers in the United States, New York City is largely serviced by a combined sewer system where stormwater that falls on impervious surfaces such as rooftops and streets, and wastewater from homes and businesses, are carried through a single sewer pipe to treatment plants. During heavy rainfall, the amount of stormwater entering the sewers can exceed the capacity of the system and a combination of stormwater and wastewater—called a combined sewer overflow (CSO)—can be discharged into local waterways. Over the last decade, DEP has invested more than $10 billion in upgrades to wastewater treatment plants and related efforts to reduce CSOs and today New York Harbor is cleaner and healthier than it has been in more than a century. However, CSOs remain the city’s top harbor water quality challenge. In 2010, the City launched the NYC Green Infrastructure Plan, an alternative approach to reducing CSOs and improving water quality that combines traditional infrastructure upgrades with cost effective green infrastructure installations that capture and retain stormwater runoff before it ever enters the sewer system and can contribute to overflows. Through 2030, DEP is planning for $1.5 billion in public funding for targeted green infrastructure installations, as well as an estimated $2.9 billion in cost-effective grey infrastructure upgrades, to significantly reduce CSOs. The Green Infrastructure Grant Program is one part of the Green Infrastructure Plan. DEP manages New York City’s water supply, providing approximately 1 billion gallons of high quality drinking water each day to more than 9 million residents, including 8.5 million in New York City. The water is delivered from a watershed that extends more than 125 miles from the city, comprising 19 reservoirs and three controlled lakes. Approximately 7,000 miles of water mains, tunnels and aqueducts bring water to homes and businesses throughout the five boroughs, and 7,500 miles of sewer lines and 96 pump stations take wastewater to 14 in-city treatment plants. DEP has nearly 6,000 employees, including almost 1,000 in the upstate watershed. In addition, DEP has a robust capital program, with a planned $18.9 billion in investments over the next 10 years that will create up to 3,000 construction-related jobs per year. For more information, visit nyc.gov/dep, like us on Facebook, or follow us on Twitter.